Starting your life together is a big step, and it's important to have an engagement ring you feel represents you as a couple. Conflict diamonds, as well as stones mined in environmentally destructive ways, can give an otherwise wonderful piece of jewelry a feeling of ethical concern. Fortunately, there are several alternatives to help you get a special ring you can feel good about owning for the rest of your life. Using pre-existing diamond fragments, labs can create real diamonds that are optically and chemically identical to natural diamonds. However, lab-made diamonds don't have the same social and environmental concerns that plague the diamond mining industry. Some labs, like the Diamond Foundry, even use solar power to create the diamonds, further reducing the environmental impact of the gems. Lab-created diamonds come in every shape and size, so you can find a gem that perfectly fits your personal style. Lab-grown diamonds can be colorless, or you can choose fancy-colored alternatives if you'd like a pop of color. Because they are real diamonds, they have the same sparkle in your engagement ring as a traditional mined diamond. If you love the colorless sparkle of genuine diamonds but want something a little different, there are some ethical alternatives in the form of simulated diamonds. These colorless, manmade gems don't have the same social and environmental impact of mined diamonds. They also don't have the same chemical properties and crystal structure like lab-created diamonds. In many cases, they are significantly less expensive than natural or lab-grown diamonds as well. Moissonite is a sparkling manmade gem that has been around since the 1990s, and it's in high demand among brides-to-be who want an ethical alternative. It's also much more affordable than a diamond, but it can sometimes have a very slight green or grey tint in certain light. Because of the tint, it works well with cool-toned metals that will help disguise the color. Not quite as hard or sparkly as a genuine diamond, but nearly indistinguishable to the untrained eye, cubic zirconia offers an ethical and affordable choice for those who would like something different. This is one of the least expensive options as well. As you're shopping, remember that if cubic zirconia is hand-cut, it's more likely to look like a genuine diamond. Considered by jewelers to be the simulated diamond with the most sparkle, Asha has an upper layer that is made up of the same chemical material as lab-created diamonds. Beneath that layer, it's composed of simulated diamond. This makes it a bit more fragile than a traditional diamond, but it does not have the ethical complications that come with mining. This is a good choice if you're on a budget and want an ethical choice but want that characteristic diamond sparkle too. Recycled gems are stones that were used in jewelry in years past. The advantage here is that you are not supporting unjust practices in the diamond industry because you are not buying gems that are currently being mined. By using recycled gems, you are also not harming the environment by supporting mining, processing, or transport of new gems. This is one of the best options if you want a genuine, natural diamond or other gem without the ethical controversy. 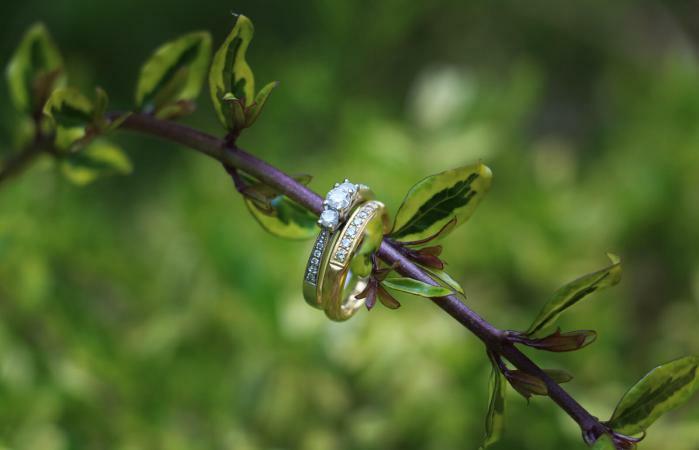 Heirloom engagement rings are passed from generation to generation in a family. If you have a ring in your family, reusing this piece of jewelry can eliminate any ethical concerns you may have regarding the diamond industry. However, you don't have to feel stuck with the styles of decades past if you're a modern bride-to-be. You can also have the gem from another family piece reset in a new ring. 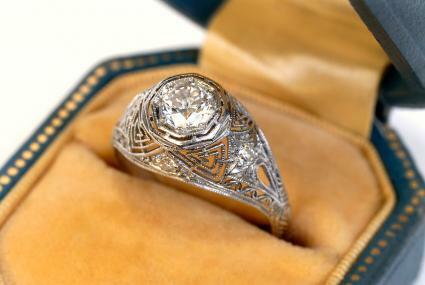 Another great option is to use an antique engagement ring. You can shop for antique rings online or in local stores, and you can use the ring as-is or have it reconfigured or redesigned to fit your own personal style. Either way, the stone isn't new and fraught with the controversy of current mining practices. The Gemological Institute of America (GIA) reports that in the last five years, several million carats of diamonds have been recycled. These stones, mined years ago and then sold through pawnbrokers and other resale shops, are working their way back into the jewelry industry at a volume that is about the same as a large diamond mine. Some of these diamonds are re-cut before being used in new jewelry, and some are used as they are. Older cuts can give your ring a vintage feel, or you can choose re-cut options for a very modern look. Colored gemstones are an alternative to traditional diamonds, but they are not without their own ethical considerations. According to the GIA, colored gem mining and production is associated with child labor, forced labor, environmental destruction, and sometimes violence. The GIA notes that these issues are usually associated with diamonds exclusively, but they are just as much of a problem with colored gems. One solution the GIA recommends is using recycled gemstones from other jewelry. MiaDonna - Offering lab-grown diamonds and committed to social and environmental responsibility, MiaDonna even plants a tree for every order to help offset the carbon generated in shipping. You'll find delicate, classically beautiful engagement ring designs here. Fair Trade Jewelry Company - Based in Toronto, the Fair Trade Jewelry Company uses lab-grown and recycled vintage diamonds to make custom rings for consumers around the world. This is a great place to look for a one-of-a-kind ring made with the highest ethical standards. Brilliant Earth - Starting with recycled, lab-grown, or rigorously sourced diamonds and adding recycled gold and other precious metals, Brilliant Earth works to make sure every part of every ring is ethical. There are styles to suit any bride-to-be, from those with modern taste to those who prefer the antique look. Feeling great about your ring is important for such a significant and meaningful piece of jewelry. Whether you choose a manmade diamond alternative, a lab-created real diamond, or a recycled gem mined decades ago, you will love your ring even more because it doesn't compromise your ethical standards.